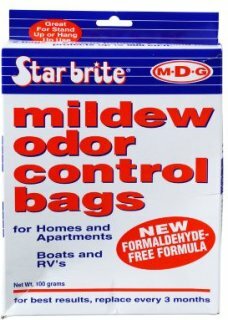 Protect your boat, RV, camper and even your basement and closets at home from mildew and musty odors with Star Brite's Mildew Control Bags. The formaldehyde free, non-toxic Mildew Control Bags are environmentally safe and each bag is designed to protect up to 400 cubic feet. Mildew Control Bags are also great for neutralizing foul smelling cigarette odors. 2 bags.